Under certain circumstances, the conditions of Construction Noise Permits (CNPs) may require notifying the Authority in advance of the commencement of work covered by the CNP. Such notification shall be made within 14 days but no less than 48 hours before commencement of work for every work location. The location, date, time as well as the details of work program (including different phases or sequence of works) shall be included in the notification. 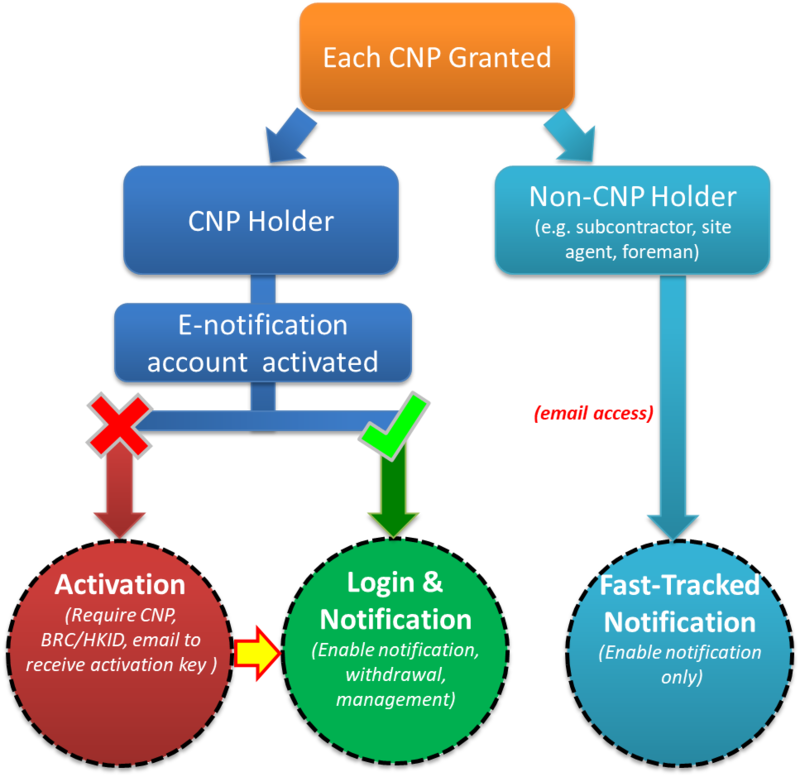 Users should activate the notification system for each CNP, for which advance notification of commencement of work is required, by clicking on “Activate” button, submitting all details and clicking “Activate” button again. Click “OK” when the system prompts for confirmation. To make a new notification, click on “Make Notification”. Choose the area of the worklocation on the map provided, input nature of work, detailed location of work, time & duration and details of work programme. Please make sure that your notification is made at least 48 hours before of work commencement. Click on “Add More Work Detail” or “Copy Last Work Detail” to add or duplicate the content in the system. To copy notification from previous record, click on blue icon “Copy from Previous Record”. See help video - “Make Notification”. To withdraw notification, click on “Withdraw Notification”. Click on the red icon “Withdraw” in same row as the notification to be withdrawn. Click “OK” when the system prompts for confirmation. See help video - “Withdraw Notification”. To change password, click on “Hi, CNP holder of [CNP number]!” on upper right hand corner. Then click “Click here to change password” to insert old and new passwords.